Except they did, apparently; that’s per no less authoritative a source than, well, Ready Player One director Steven Spielberg. Fandango’s Erik Davis posted an interview clip of Spielberg talking about the film yesterday, mentioning how a number of studios—including Disney—apparently bent over backwards to help him assemble Ernest Cline’s overwhelming collage of ’80s pop culture beats. Spielberg goes so far as to name a few Star Wars elements—an appearance by R2-D2 and an X-Wing, both of which are mentioned in the book—as specific Easter Eggs, which raises the question: What gives, Steven? It’s possible that Spielberg was just quoted out of context or misheard, of course (although he supposedly bantered a bit with Rogue One/Ready Player One star Ben Mendelsohn about his whole “we couldn’t get the rights” thing, which seems like it’d have to be a pretty elaborate fabrication). Or maybe he misspoke, and his interview with Davis was an attempt to clear the air. 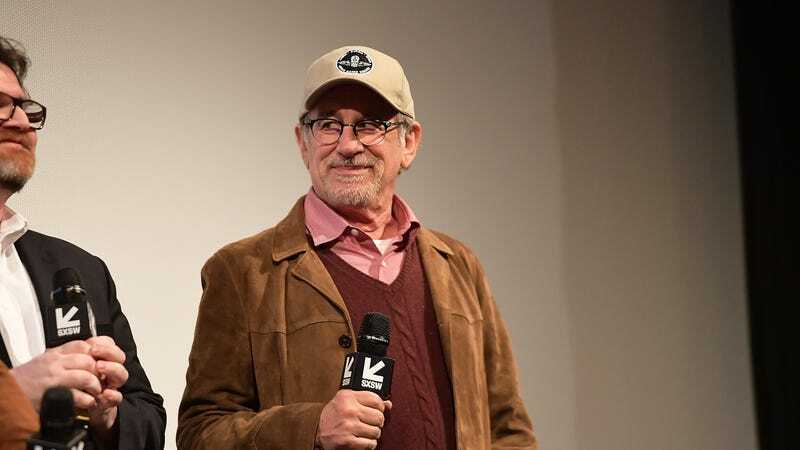 Or (and this is just our personal pet theory), maybe the Spielberg at the press conference was actually some kind of rogue CGI avatar, accidentally unleashed on the Earth from the future, and sent on a mission to harvest a rich bounty of disappointed nerd tears. Interestingly, Spielberg notes in the interview that he was very careful about which Star Wars references made the film’s cut, given that the franchise is a still-living creature that extends well past his film’s nostalgic milieu. “That’s really part of our contemporary world right now, and even though it began in the ’80s, it is so much a part of our real life today in the 21st century. So we asked for some of the smaller items and Disney gave us everything we asked for,” this version of the director told Davis. Attendees at this year’s SXSW, where the film had its surprise world premiere, already presumably know which Steven was telling the truth; the rest of us will have to wait until the film debuts on March 29.